safflower oil black hair | hair, there and everywhere! OK! That was a corny joke, but I wanted to showcase my new oils, with one of them sharing a key ingredient with a narcotic that is legal in the state 25 minutes from me! I had an eyebrow appointment there that is near the Whole Foods. I need some new oils, as the ones I bought in the beginning of my HHJ almost 17 months ago and slowly but surely getting used up. I had two oils in mind: safflower oil and hemp seed oil. These both are rich in ceramides. 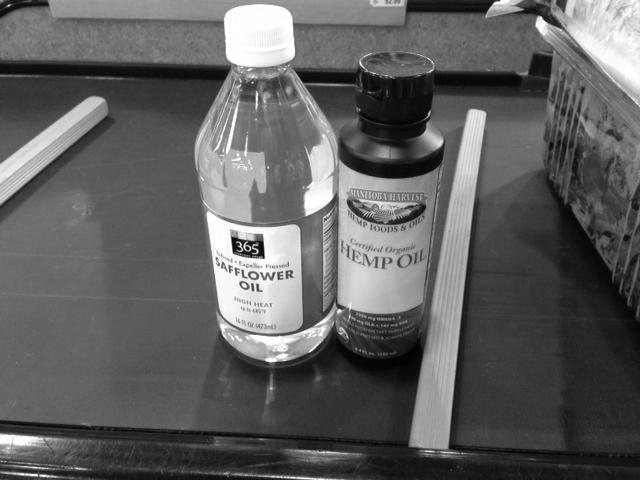 For the longest time, I have been wanting to try hemp seed oil. The last time I looked for it was in December 2012. It was expensive (about $17 for ~16 oz) and I just didn’t want to commit to that price in case my hair did not like it. Today, they had a smaller 8.4 oz size for about $9. I was definitely in! I remember Jeni from Just Grow Already! mentioning a long time ago that hemp seed oil smooths the ends of the hair, which is definitely something that I am needing in my life right now! Hair loss. For some, it is a sensitive subject, yet at one time or another we all have experienced some type of hair loss or hair damage. Hair loss, thinning hair, slow hair growth – these are all conditions that can be caused by many factors, including toxicity, illness, infection, chemical medical treatments, hormone imbalance, stress, and poor nutrition. Another factor in weak, damaged, thin hair or hair loss is the absence of sufficient ceramides. Ceramides are fatty substances found in the skin and hair. Ceramides are comprised of 2 molecules – sphingosine (an amino alcohol) and a fatty acid. Ceramides help the hair retain moisture and protein. This is especially useful for those who color or use heat on their hair. GLA, also known as Omega 6 fatty acid, has been shown to help improve hair growth for some, as well as nourishing the hair so that it grows thicker and stronger. Hempseed oil is an excellent source for GLA and ceramides. Hempseed oil has the perfect ratio of Omega fatty acids, and it is easily digestible. Getting enough Omega fatty acids in the diet will help the hair, as well as using topical products that contain hempseed oil (shampoos, conditioners, hair tonics). Proper nutrition and sufficient nutrients are important for healthy hair (and skin). Hempseed oil is an anti-inflammatory, and because some hair loss is due to inflammatory conditions, hempseed oil may be a good supplement for that reason as well. I cannot wait to use it! I will probably use it in a hot oil treatment after I do my protein treatment on Monday. I will play around with both oils and see how they are working for my hair!